In this day and age many of us struggle paying back money we have borrowed or credit we have obtained and as such we find ourselves having to ask for more time to pay this money or these loans back. It is something that many people find difficult to do and indeed in some cases there is such a reluctance to ask for more time to pay that the debt increases and the individual may find themselves facing a County Court Judgment. I've Gotten into Financial Difficulties What Should I Do? The first thing to do, perhaps as contrived as it may sound, is not to panic. 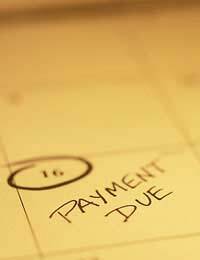 You should remember that you are not the only person to fall behind with repayments. Indeed there are thousands if not millions of people in the United Kingdom alone today who are struggling to pay back debts. It is important to make a list of all you need to pay out and the best way to do this is by using a spreadsheet. If you are not computer literate enough to create your own spreadsheet ask a family member or close friend to help you. This will also give you ample time to discuss the problem with them also. Whilst producing your spreadsheet you should detail the amount of money you have coming into the house and how much you have going back out. This is what we refer to as input and output. Your spreadsheet should have a column with overall figures that are easily read by anyone who sees it. This is another important aspect of asking for more time to pay. Even if you are still in the throes of finding out exactly what your incomings and outgoings are it is worth while getting in touch with those companies or institutions you owe money to and informing them of your situation. You will find for the most part these companies will be happy to hear from you and will, where they can, try to help you even if it is offering you a reduction in repayment amounts for a couple of months. We really cannot stress enough the importance of making contact rather than waiting for your debtors to make contact with you. If you pre-empt your debtors you will find them much more willing to assist than if they have to chase you for payments. Some companies may express a desire for something in writing from you rather than a simple telephone call. If this is the case a simple standard letter onto which the addresses of each company can be merged is enough. Attach your spreadsheet to the letter and send it to the named member of staff at the other end. The spreadsheet allows them to see for themselves that the information you supplied on the telephone was genuine and also allows them to work out what is acceptable as a repayment. There is a tendency for many individuals to simply say they cannot pay anything. This is not a good idea as it will only serve to have your debtor dig his or her heels in and ask for money you simply cannot afford. A good way to test the way is to offer a token payment of say £5 per month. You may think that they will not accept this but many companies will simply to prevent you or them having to pursue the matter through courts or through bailiffs who will invariably cost more than the debt is worth. A gesture payment is much more likely to buy you some time as opposed to a simple 'I can't pay' so where possible - and this again is where your spreadsheet will prove invaluable - make some offer rather than none at all. For more information you should contact your local Citizen's Advice Bureau who will be happy to advise you further.